A grip providing maximum control and hand protection under extreme conditions. Their choice was the Flesheater™ 2 handle. 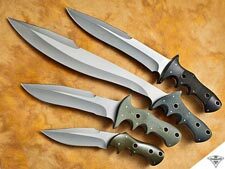 A minimal blade length when coupled with the FE2 handle that would be compact and easy to carry yet fully functional for an array of survival tasks. The blade having a flat spine area and suitable tip for batoning, the technique of splitting wood by driving the blade through the material from repeated strikes on the spine using a baton-like stick, making kindling for fire making. The wedging effect of the blade from the edge and up the hollow grind through the thicker ricasso aids in this separation. Have a suitable blade belly for skinning and game preparation, as well as for food preparation. Have a blade tip serviceable for first aid, pinpoint cutting and penetration. Incorporate a secondary upper grind that would be more efficient in stronger draw cuts on vines, etc. Overall design should also serve as a personal defense knife if needed. 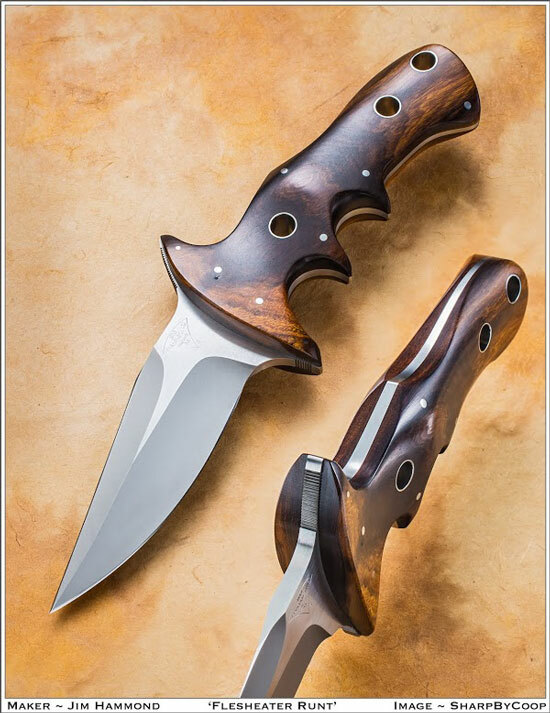 NOTE: The particular Runt shown in the photograph is not the standard model but a custom variation having a presentation grade Desert Ironwood handle, a hand-rubbed satin ricasso on the blade with bead-blast bevels and a hand-rubbed satin finish around the perimeter of the knife. The actual appearance for the standard Runt, having a bead blast blade with black linen micarta scales, can be seen on the Flesheater 5 Bolo. Having approximately the same overall length as the Overwatch™, the Runt™ provides a compact, versatile and fully functional survival knife package that will ‘get ‘er done’ when the bottom line for survival simply means staying alive.